At Precision for Medicine (formerly ApoCell) we identify and optimize innovative platform technologies for detecting various types of biomarkers using various specimen types. These platform technologies can be used independently to support biomarker assays, however, our expertise in creating solutions for our clients is to integrate these technologies into complex workflows to optimize data generation. These complex workflows are essential for answering challenging translational research questions while preserving the amount of biological specimen needed to run the assay. Our integrated platform technology approach allows us to detect biomarkers using cutting-edge technologies in both ‘liquid biopsy’ and ‘tumor biopsy’ samples to maximize data generation. We specialize in working with whole blood to maximize the number of biomarker assays that can be analyzed from a single tube of blood in our CLIA regulated laboratory. 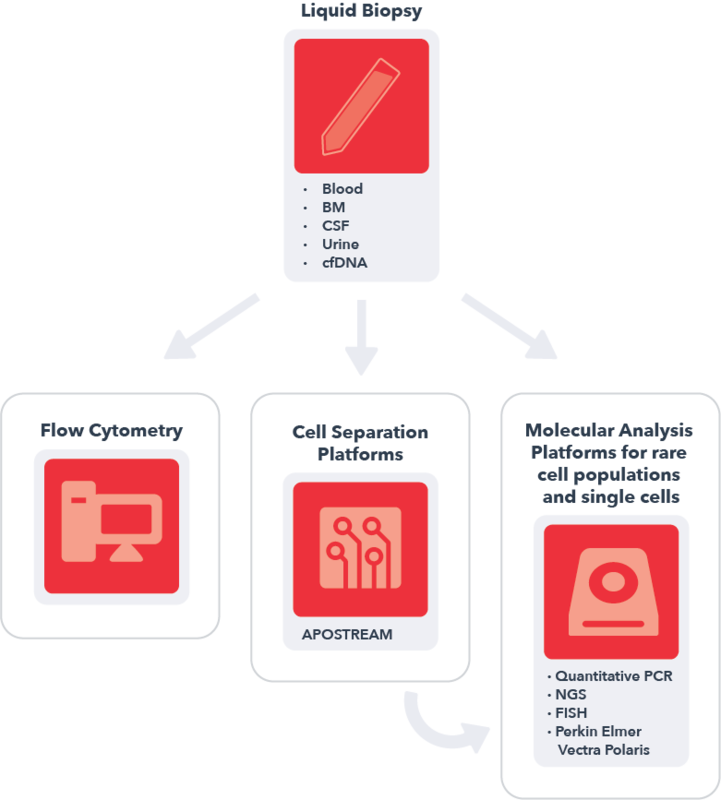 This integrated approach includes identifying more frequent cellular populations as well as isolating rare Circulating Tumor Cells (CTCs), Stem Cells, Progenitor cells and differentiated immune cells including CAR-T cells, Activated T cells and other less frequent immune cell populations all from the same sample using the ApoStream technology. Once the target cells of interest are isolated, we interrogate them using quantitative immunofluorescence image analysis, flow cytometry, immunohistochemistry, and genomic based assays. Additionally, we specialize in detecting low levels of cell-free circulating tumor DNA (ctDNA) and biologically relevant markers circulating in blood such as cytokines. Our integrated platform technology approach enables the ability to work with tumor tissue to generate both phenotypic and genomic information from the same biopsy sample. We specialize in high-complexity, multiplex immunofluorescence detection using our state-of-the-art image analysis platform to address complex questions regarding frequency of cell populations for Immuno-oncology applications including spatial orientation and pharmacodynamic changes in protein expression of various signaling pathways. This approach combined with our automated FISH and sequencing capabilities enables multiple genomic endpoints to be measured from the same tissue sample addressing complex biological questions. 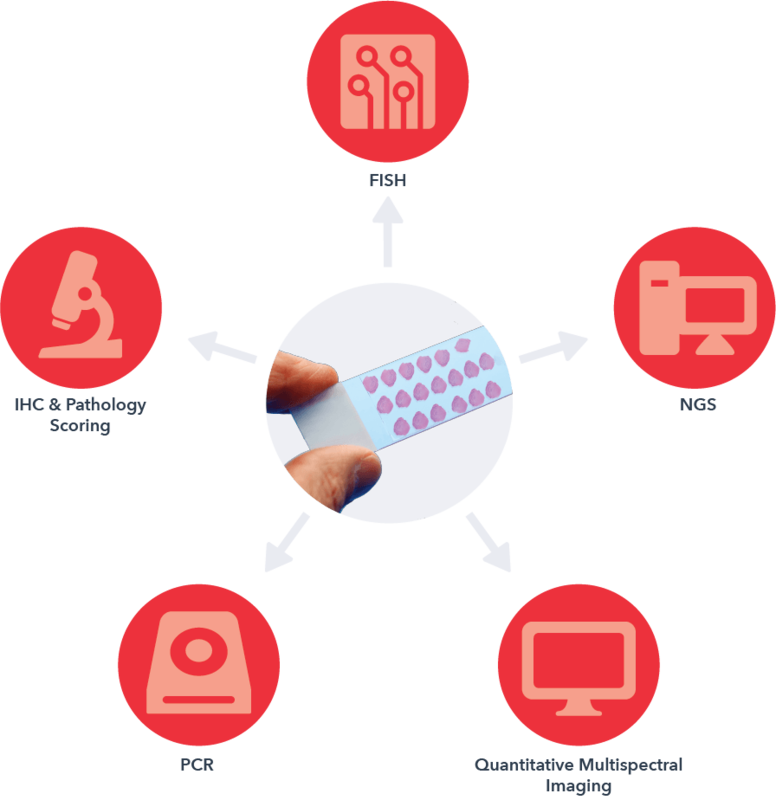 We also specialize in challenging work flows that require fast processing and a short turn-around time including real-time data reporting for patient enrollment in clinical studies and validation of immunohistochemistry assays for CLIA testing. Precision for Medicine’s integrated platform technologies help advance immuno-oncology drug candidates from pre-clinical discovery through phase III clinical trials.